It is called the “helicopter”. You are stripped, hands and feet bound and tied to a tree, hanging or raised above the ground so you are forced to stand on your toes for hours on end. With hands still bound to the tree you are then forced to the ground to endure up to 24 hours of the unbearably hot sun and cold night, desperately willing your punisher to have mercy. If you are lucky the punisher will allow you a short break for meals or to use the toilet. What human being deserves this? We are told there is never a justification for inflicting torture, degrading treatment or punishment on a human being. 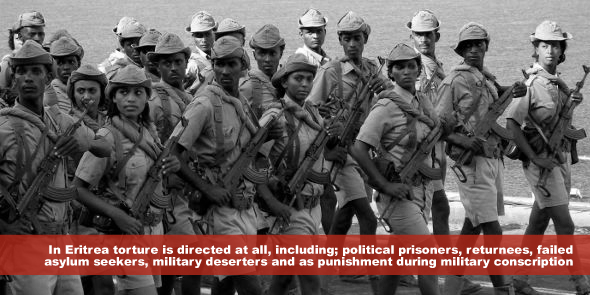 The Eritrean government, conveniently not party to this Convention, disregards this absolute prohibition – and as a result torture, both physical and psychological, is widespread in Eritrea. Torture is regularly used in Eritrean prisons, military barracks and at Sawa military camp. Sawa qualifies as a military training camp, a detention facility and a school where children are sent in their final high school year (Grade 12) to prepare for military service while they complete their schooling. In Eritrea torture is directed at all, including; political prisoners, returnees, failed asylum seekers, military deserters and as punishment during military conscription. It is also used against students attending Sawa or those who persons who practice religions which are banned by the Eritrean government. As incommunicado detention is prevalent, deaths resulting from torture and appalling detention conditions are common. The absence of any independent monitors, access by family, lawyers or doctors, or free media makes it impossible to have a true account of the life and death count. Imagine being a young girl tired from the day’s strenuous military training and too weak to carry out your daily chores of cleaning the restrooms. Imagine the guard asking you to roll in the scorching sand at the hottest time of the day as punishment. Then imagine the young girl losing control and rolling into the electric fence barrier where she and the friend trying to rescue her are electrocuted to death whilst all the young recruits are forced to watch. These young girls were undergoing their military training; they died not in battle, nor did they ever know or face an enemy; they died at the hands of their own government – those bent on making soldiers out of them. The torture committed in Eritrea takes on various perverse forms: beatings cover whole bodies and the weapon of choice used is a thick metal bar or chain, victims are handcuffed for long periods of time and firearms frequently pointed at detainees during interrogations.The Eritrean government has itself asserted during the Universal Periodic Review (UPR), where states report on the state of human rights, that torture was criminalized in its legal system. However, the reality is that torture continues to be used as a weapon against perceived dissents with the psychological result of instilling fear in the population. The International Day in Support of Victims of Torture is a reminder to survivors that they are not forgotten. It is a reminder to the Eritrean government that all allegations of torture need to be investigated promptly, perpetrators must be held accountable and victims provided with redress. Existing policies and practices in Eritrea that allow for the use of torture must be annulled. Eritrea must ratify the International Convention Against Torture and put in place national laws against torture. It is with these practical measures that Eritrea can claim and account for their commitment to eliminating torture.